A little birthday treat for my littlest Liso who celebrated her big 28 last Friday. I needed something that was compact and easy to transport—and something that would not make me look totally ridiculous waiting in line at the club (so much for that one—one club manager thought I brought my make-up kit). Brownies seemed like the wisest choice, yet again. I could never get sick of brownies (baking or eating), but they are far from what I would call pretty. They’re frumpy, brown squares—not exactly delicate or eye-catching. So how do you turn something ho-hum into something ta-dah? You call them French (or at least, according to Dorie Greenspan, French-inspired) and all of a sudden you’ve upped the ooh la la quotient in a major way. That’s exactly what Dorie did in her recipe for French Chocolate Brownies (not sure why she thought it necessary to include “chocolate” in the title). By the way, I substituted vanilla extract for the rum—I didn’ t have any at home, and vanilla was the closest thing I could find that has a similar alcohol flavor. Center a rack in the oven and preheat the oven to 300°F. Line an 8-inch square baking pan with foil, butter the foil, place the pan on a baking sheet, and set aside. 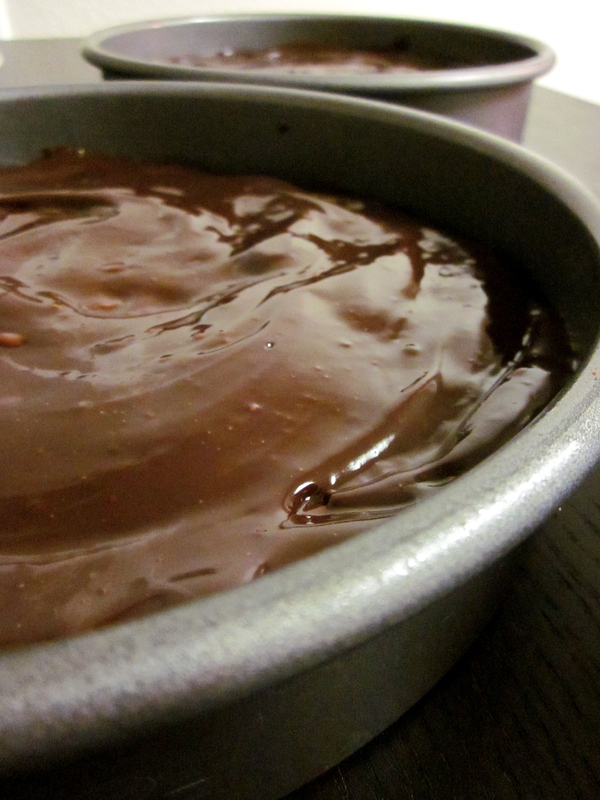 Put the chocolate in a heatproof bowl and set the bowl over a saucepan of simmering water. Slowly and gently melt the chocolate, stirring occasionally. Remove the bowl from the saucepan and add the butter, stirring so that it melts. It’s important that the chocolate and butter not get very hot. However, if the butter is not melting, you can put the bowl back over the still-hot water for a minute. If you’ve got a couple of little bits of unmelted butter, leave them—it’s better to have a few bits than to overheat the whole. Set the chocolate aside for the moment. Working with a stand mixer with the whisk attachment, or with a hand mixer in a large bowl, beat the eggs and sugar until they are thick and pale, about 2 minutes. Lower the mixer speed and pour in the chocolate-butter, mixing only until it is incorporated—you’ll have a thick, creamy batter. Add the dry ingredients and mix at low speed for about 30 seconds—the dry ingredients won’t be completely incorporated and that’s fine. Finish folding in the dry ingredients by hand with a rubber spatula, then fold in the raisins along with any liquid remaining in the pan. Scrape the batter into the pan and bake 50 to 60 minutes, or until the top is dry and crackled and a knife inserted into the center of the cake comes out clean. Transfer the pan to a rack and allow the brownies to cool to warm or room temperature.Carefully lift the brownies out of the pan, using the foil edges as handles, and transfer to a cutting board. With a long-bladed knife, cut the brownies into 16 squares, each roughly 2 inches on a side, taking care not to cut through the foil. 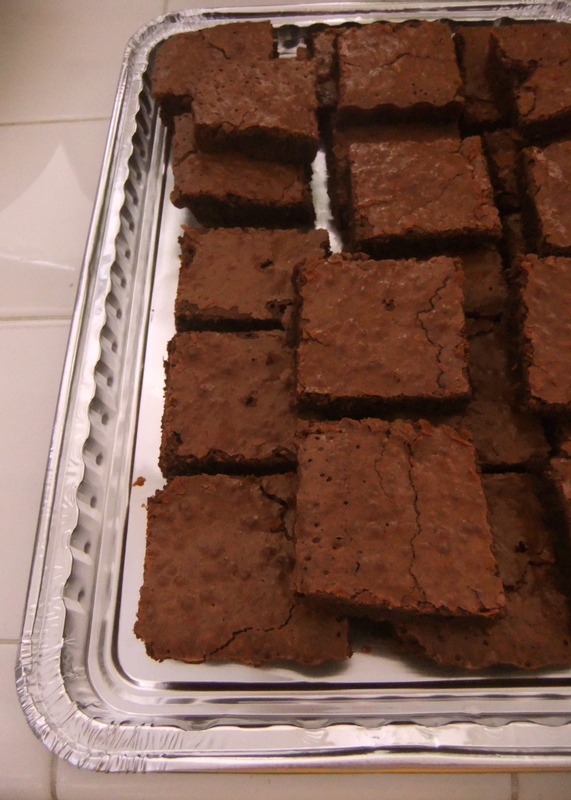 *Serving: The brownies are good just warm or at room temperature; they’re even fine cold. I like these with a little something on top or alongside—good go-alongs are whipped crème fraiche or whipped cream, ice cream or chocolate sauce or even all three! *Storing: Wrapped well, these can be kept at room temperature for up to 3 days or frozen for up to 2 months. Grapefruit Bars. Just for Me. I’ve been so stressed lately, I swear I’m going to develop an ulcer (-_-“). It just seems like everyone wants a piece of me right now. Sigh. So even though I have a million things on my plate, I still made time to bake these cute grapefruit bars. 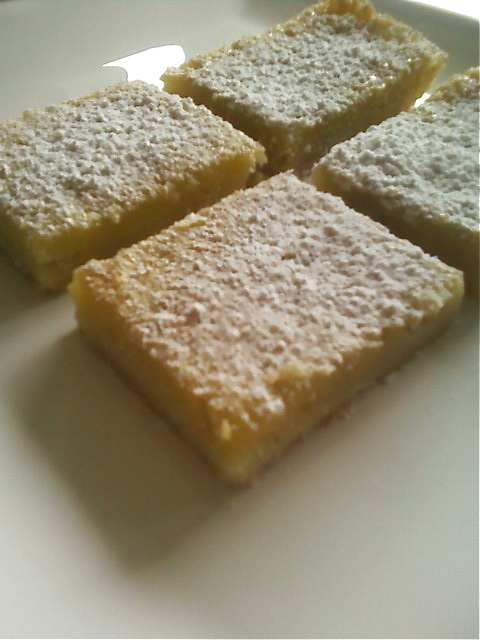 The original recipe used Meyer Lemons and is from Alpineberry (one of my favorite blogs). I love Meyers but these sad, little grapefruits have been sitting in the fruit bowl for weeks now, crying out for help. They turned out so great in this recipe. You don’t need any special gadgets, and it takes all of 1 hour—from start to finish—to whip them up. Really. Pre-heat the oven to 350F. Butter and line an 8-inch square pan with parchment paper. Prepare the crust: sift flour, confectioners’ sugar and salt into the bowl of a food processor. Add butter and pulse until the mixture is pebbly. (You can also do this by hand) Press mixture evenly into the bottom of your prepared pan. Bake until lightly golden, about 18-20 minutes. Set aside crust. Prepare the filling: In a medium bowl, whisk together eggs, sugar, flour and salt. Whisk in grapefruit zest and juice until well combined. Pour filling over the baked crust (It’s okay if crust is still hot). Bake until filling is just set, about 15 – 18 minutes (I needed only 15). Cool completely before serving. Dust with confectioners’ sugar if desired. Last weekend I was invited to yet another friend of a friend’s barbecue. (Considering that this city is almost always engulfed in a thick cloak of fog, it is surprising how often people barbecue. 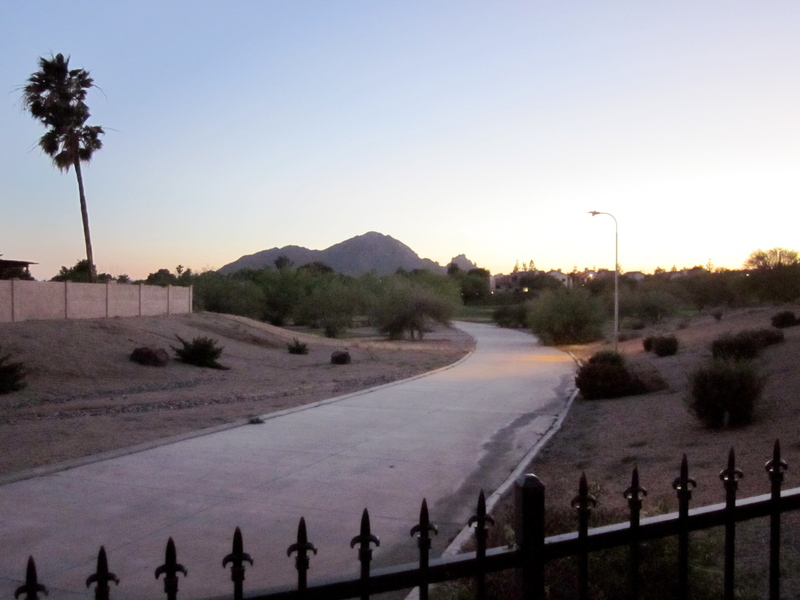 I guess sun and warm weather aren’t BBQ pre-reqs here.) My friend brought a lovely caprese salad, and I brought blondies. Blondies are a curious thing: not brown, so definitely not a brownie; their primary ingredient is white chocolate (which consists of cocoa butter and no actual cocoa solids), so not exactly chocolate either. I ended up relying on a Nigella Lawson recipe I read about over on Jules Food. (Check out the recipe link—her blondie shots are incredible.) In her post, Jules describes her issues experienced due to a too short bake-time (35 min). I, too, had this issue: the squares on the outer-edges were baked perfectly—firm while still retaining a creamy, smooth texture in the middle. 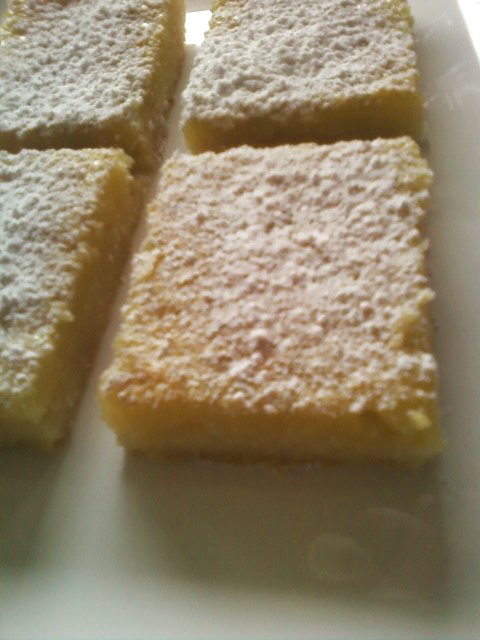 The inner squares, however, were just plain gooey and impossible to cut. I almost rough-chopped and set aside the whole batch for later mixing with vanilla ice cream (white chocolate-pecan blondie ice cream)—they were that ugly. In the end, though, I put them in the freezer for an hour, in the hopes of salvaging something from the whole mess. And you know what, it worked. 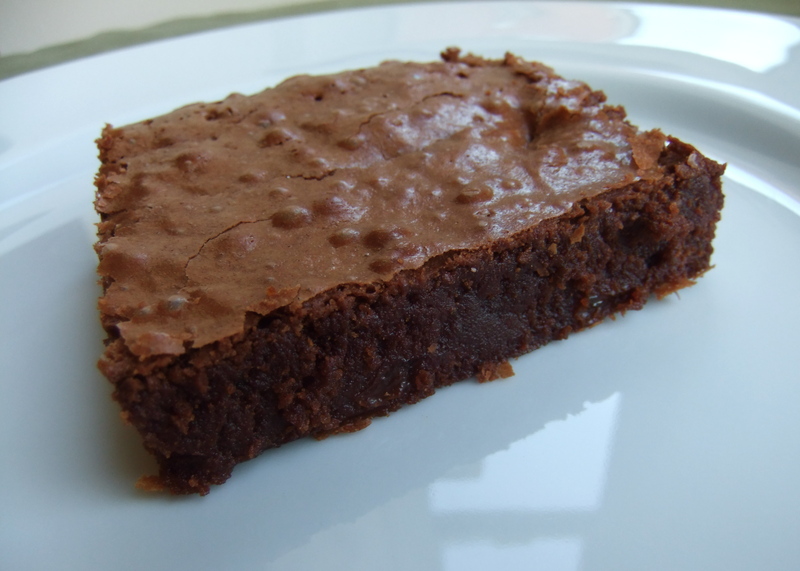 (See post Fudgy Brownies for a BBQ for more info on this method.) I was able to trim off all the sloppy edges and create nice, clean squares that I could proudly bring to any social occasion. So, was it worth it in the end? I’m not so sure. Yeah, they tasted pretty good—I stuck to the original recipe which calls for pecans, which I think balanced the sugary-cocoa-butter sweetness of the white chocolate (Jules used macadamias). I also found the white chocolate a refreshing change, especially for palettes more accustomed to the deeper, denser flavor of chocolate. At the end of the day, though, it’s still brownies over blondies for me. Preheat the oven to 340°F / 170°C / gas mark 3. Melt the butter and chocolate either in a microwave or a double boiler. In a large bowl, beat the eggs with the salt until light and beginning to build up in volume (about 4 min. by hand). Then add the sugar and the vanilla, and continue beating until really creamy and thick. Beat in the slightly cooled chocolate mixture and then add the flour and nuts, folding in gently. Pour into your prepared tin and cook for 35 minutes (45 might be better) or until set on top and gooey in the middle. Remove from the oven and let cool completely before slicing. It’s Labor Day weekend here, and guess what—it’s sunny. And warm. Crazy! No big plans for the long weekend. The family was down from Portland all last week—the family-fun marathon ended only Wednesday—so I’m taking it easy. I’m not being completely anti-social, though (^_^”) My friend invited me to a barbecue she and her boyfriend are throwing. And my contribution for the occasion? Brownies. 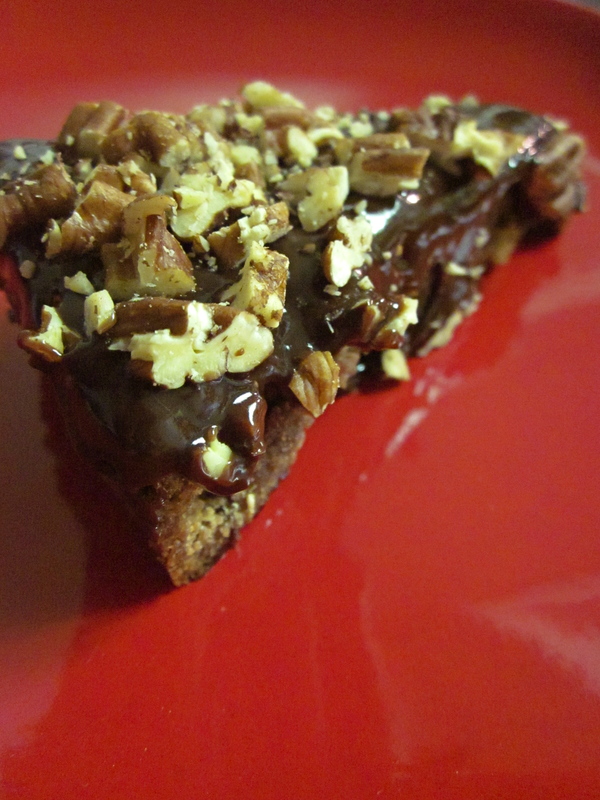 Fudgy-hazelnut-dark chocolate brownies actually. Though I had originally planned on using my stand-by recipe from Martha Stewart, I ended up having to try a new one—one that doesn’t require any cocoa (forgot to pick some up). The recipe is from Emiline over at (Visions of) Sugar Plum. It’s different from any other I’ve tried, as it requires one to place the direct-from-the-oven brownies into ice water and then into the freezer for an hour. The mixing process was also a bit simpler—no messing with bain maries; butter and chocolate are melted directly in a saucepan. OMG—they are incredible. Sharp, intense, rich and luxurious. When I took them out of the freezer, I was afraid they would be frozen solid through but after cutting them into squares and tasting them, I realized they were anything but. 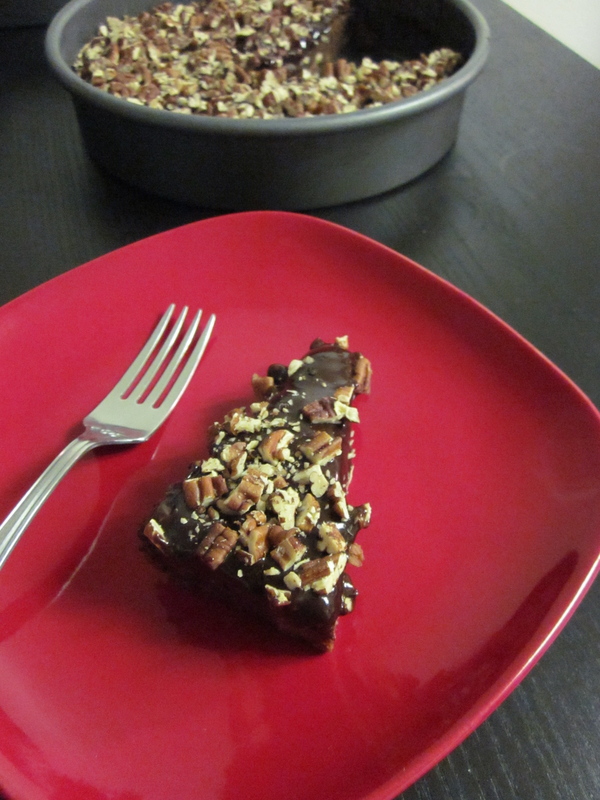 Velvety smooth fudge in the middle with chopped hazelnuts throughout. 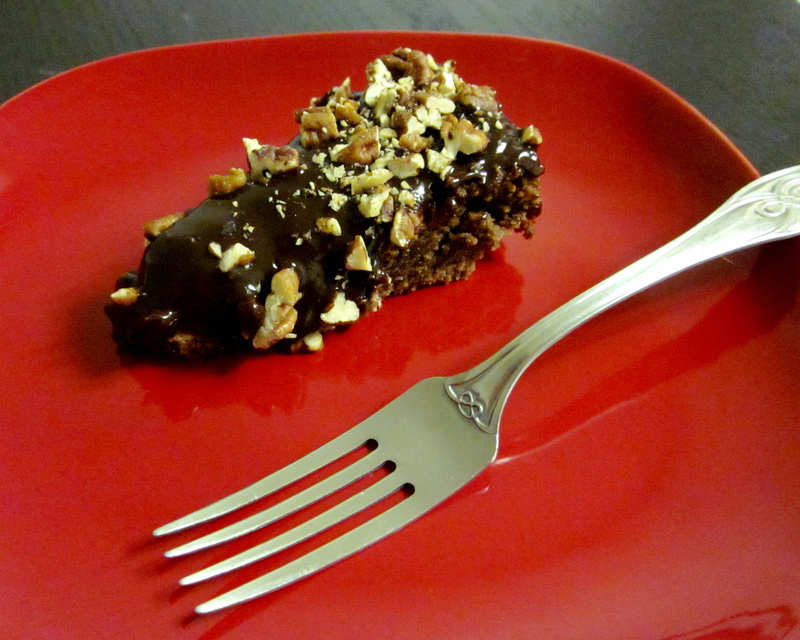 The hazelnuts really add texture as well as cut through the intensity of the dark chocolate a bit (but definitely don’t take away from it either). My verdict? Freezing the brownies is such a good idea—you have a chilled brownie that is super dense and holds a nice shape. Here’s hoping they hold up on the bus, light-rail and walk to the barbecue! Preheat oven to 375 degrees F. Line an 11×8-inch baking dish/pan with foil. Coat foil with shortening/non-stick spray/butter etc. Melt the butter in a large saucepan over medium heat. Turn heat off, and stir in chocolate, until melted. Set aside pan, to cool slightly. 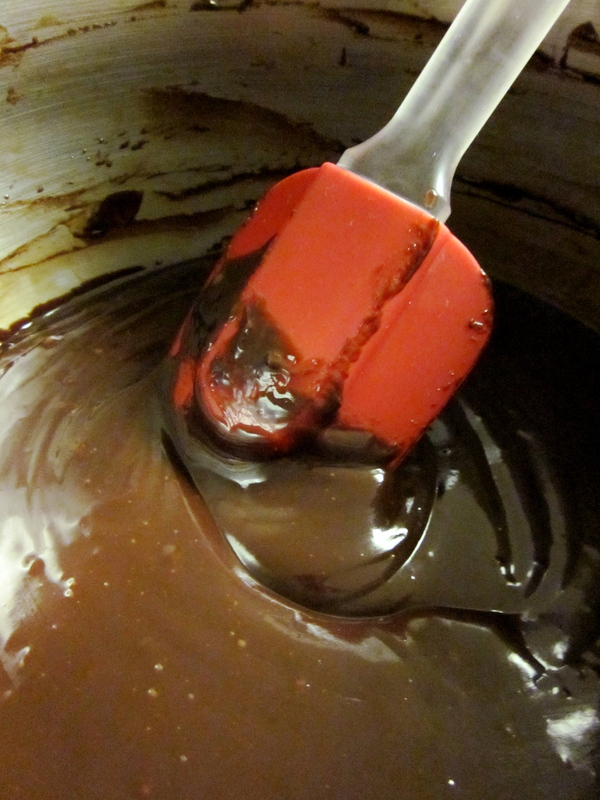 Reduce mixer speed to low, and beat in melted chocolate, until combined. Scrape batter into prepared pan, evenly. Bake at 375 degrees F, for 23-25 minutes. Plunge pan into a larger pan filled with ice water. When brownies have cooled off a bit, freeze until cold, about 1 hour. Slice into bars. What makes a good brownie? Though everyone seems to have a particular preference when it comes to these little squares, I think all would agree that a fudgy moist base and a flaky top are key. I’ve tried more than a few recipes and have definitely eaten more than my fair share of these little fudgy darlings–so I would say I recognize a good brownie when I see and eat it! The recipe below is everything a brownie should be–rich, dark chocolatey, fudgy in the middle with that wafer-thin layer of flakiness on top. Doesn’t get better than that. In my experience, I have found a few elements crucial to brownie baking success. 1) USE GOOD 70% DARK CHOCOLATE. 2) USE BUTTER. People, please be reasonable. If you’re on a diet, don’t eat brownies. 3) Let the brownies cool overnight at room temperature. They’ll cut better that way. Anyway, I’m not really sure anymore where I got this recipe from (Update: I looked–it’s from Martha). I’ve made them several times now–passing them out at work, giving them to hubby to take to work–and have heard no complaints! As for the nuts and chocolate, I usually play around with different varieties and companies. In terms of nuts, I’ve used pistachios, almonds, walnuts, pecans and hazelnuts (walnuts are still my favorite–though pecans taste mighty fine too!). In terms of chocolate, I’ve tried 70 and even 90% dark from Cadbury, Lindt and Valhrona. My advice is if it tastes good by itself, it’ll taste good baked too. 1) Preheat oven to 350F. Prepare an 8 inch square pan with butter and parchment, for easy removal. 2) Melt in a bain marie butter, chocolate and cocoa powder. Set aside and allow to cool. 3) Sift together the flour, baking powder and salt. In another bowl combine the sugar, eggs and vanilla and beat until pale and has doubled in volume – roughly 3 to 4 minutes. Quickly, but thoroughly, fold the chocolate mixture into the egg and sugar foam. Once combined, add the flour mixture and stir just until combined. 4) Pour batter into prepared baking pan, making sure to even out the top. 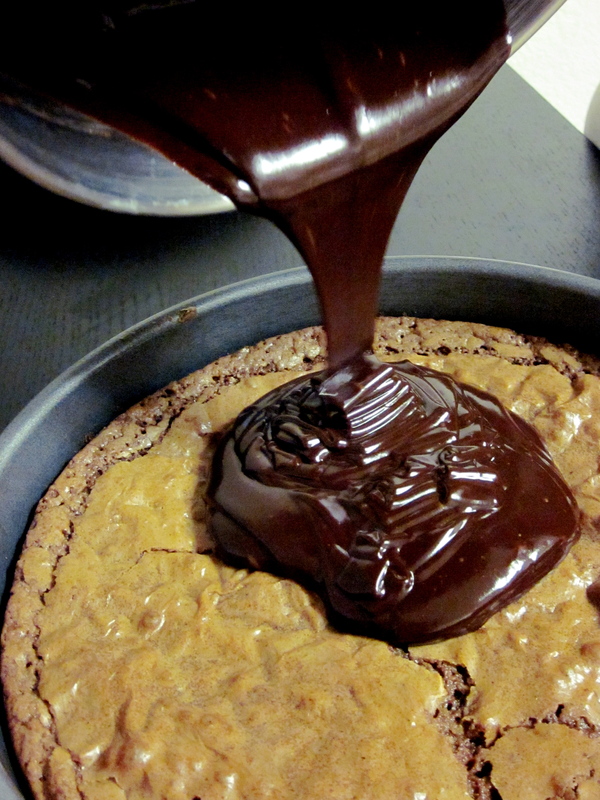 Bake for 30 minutes if you want that super fudgy brownie, or otherwise 35 minutes. To test the brownie, insert and remove a toothpick into the brownie. It should have moist crumbs clinging to its sides. 5) Once the brownie is adequately baked, let it cool in the pan overnight before cutting.